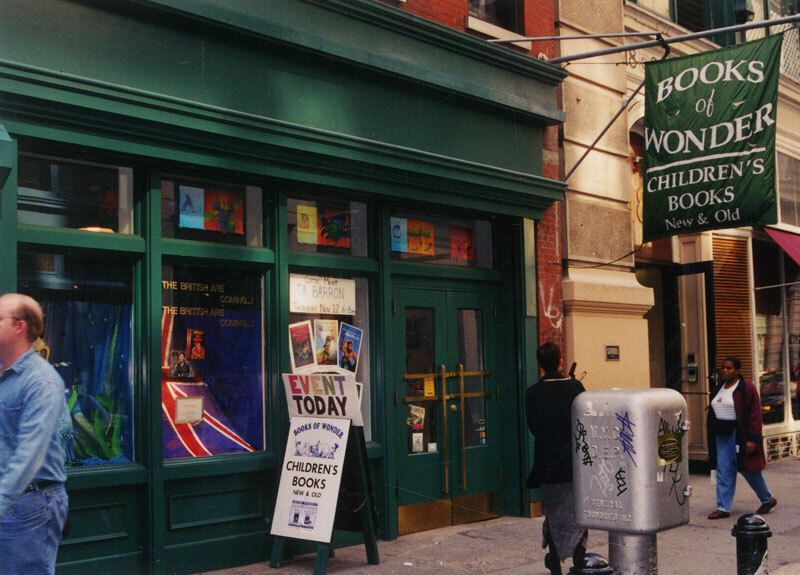 Because of problems with a former subtenant, Books of Wonder, the New York City children's bookstore founded in 1980, is experiencing a financial crisis that has led it to launch a 30-day campaign to raise a minimum of $100,000 to stay open and revitalize the store. The campaign, at indiegogo.com/booksofwonder, was announced yesterday. With the support of many children's authors and artists, the store is offering a range of gifts to contributors. A $25 donor, for example, receives an "exclusive Robert Sabuda pop-op notecard." A $350 contributor receives a "specially inscribed book by an award-winning author of your choice." At the highest level, a $10,000 donor receives "an original framed painting by award-winning artist Kuniko Y. Craft." When Books of Wonder moved into its current home on West 18th Street eight years ago, it leased out 40% of its space, including a 1,000-sq.-ft. kitchen, to Cupcake Café. Unfortunately, as Books of Wonder owner Peter Glassman wrote, "the Great Recession was even harder on cupcakes than children's books and they were forced to close, still owing us many months back rent and utilities." The store was unable to find another tenant and had to "lay out over $300,000 in rent and utilities that we expected to be paid by our subtenant," Glassman said. "This has strained our resources to the limit." Glassman is asking fans of the store to contribute and to spread the word to help us "write the next chapter for Books of Wonder." In findings that go against the common perception that in the digital age younger adults might read less and use libraries less, a new study has found that six in 10 Americans between the ages of 16 and 29 used their local public library. The youngest of this age group (16-24) are especially likely to have used the library in the past 12 months. Also, the study found that 83% of Americans between 16 and 29 read a book in the past year. Of that group, 75% read a print book, 19% read an e-book and 11% listened to an audiobook. These are among the findings of the Pew Research Center's Internet & American Life Project study of readers between the ages of 16 and 29. The data included a phone survey of nearly 3,000 people aged 16 and older as well as comments from an online panel of library patrons aged 16-29 who borrow e-books. 52% of respondents who have not borrowed e-books at libraries said they didn't know they could do so. Pew commented about younger library users: "Although their library usage patterns may often be influenced by the requirements of school assignments, their interest in the possibilities of mobile technology may also point the way toward opportunities of further engagement with libraries later in life." 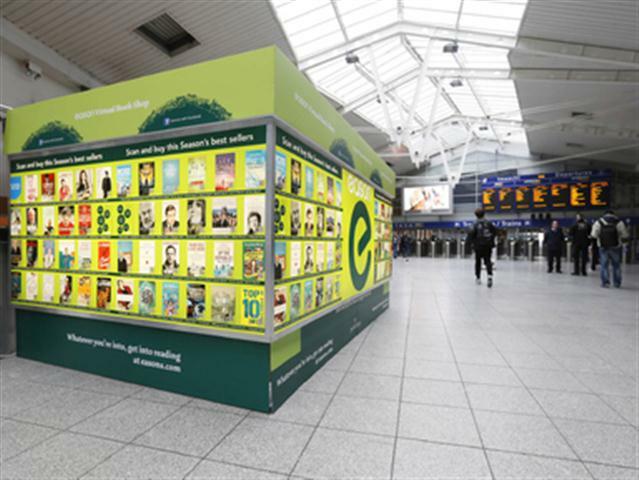 Irish bookstore chain Eason has launched a virtual mobile bookshop at Connolly Station in Dublin. From now until Christmas, commuters can purchase titles from the outlet that "looks like the shelves in a bricks-and-mortar store, displaying images of book covers from bestselling fiction, sport, kids, and food and drink titles that incorporate a QR code," Silicon Republic reported. 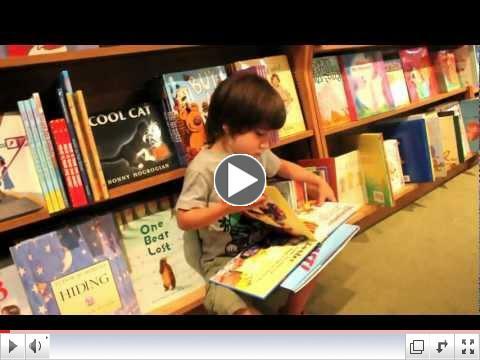 After the holidays, Eason plans to bring the virtual bookshop to other locations throughout the country. David Field, group head of marketing and retail development, said, "While the traditional physical store is still very much at the heart of Eason, we recognize the ever-growing need to further develop our online shopping experience and to create a concept that is not only innovative and a first to Irish market but that very much demonstrates that we are a contemporary multi-channel retailer." Effective December 3, Jeff Pinsker will become president of Klutz, which publishes children's books, kits and "other stuff that stimulate kids' growth through creativity." He will also become a v-p of parent company Scholastic, Inc. Most recently Pinsker was CEO of Infinitoy, an educational toy company that acquired the rights to the Zoob construction toy line and that launched Quizmo, a handheld electronic quiz game. Earlier he was president and CEO of JP Kids, a children's media company, and president of University Games, the board game company. Pinsker is also the author of 13 books, including the Quizmo series and some of Spinner Books's Armchair Puzzlers series. Steve Smith is the new publisher of Oasis Audio, succeeding Tammy Faxel, who left to assume a role in business development at Brilliance Audio. Smith has served as the v-p of sales and marketing at the company since 2010, and has more than 25 years of publishing experience. Last Friday, Books & Books Westhampton Beach, Westhampton Beach, N.Y., hosted the kickoff of David Sedaris's 2012-2013 tour at the Westhampton Beach Performing Arts Center. Sedaris delighted the audience by reading from a selection of new material drawn from his current work in progress. 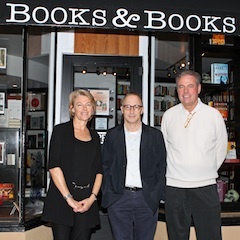 Here he is flanked by store co-owners Denise Berthiaume and Jack McKeown. 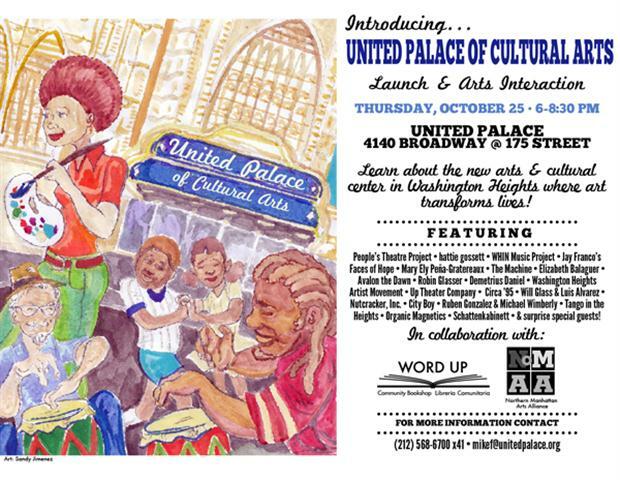 Word Up Community Bookshop, the New York City pop-up bookstore that had an extended run during the past year, is partnering with the Northern Manhattan Arts Alliance to program a literary launch this Thursday for the United Palace of Cultural Arts, GalleyCat reported. According to the organizers, "Most of these artists are being curated by volunteers from Word Up Community Bookshop, the pop-up bookstore that occupied an empty storefront across the street from the Palace for a year before being forced out by a steep rent hike. Much of Word Up's inventory is being stored in the Palace basement as it searches for a new location." The Billy Pilgrim Traveling Library, a new bookmobile venture based in Houston, was described by Boing Boing as both "decidedly and delightfully old school" as well as "decidedly (and delightfully) new. Its founders, Kelly Allen and Chris Grawl, plan to crowdfund the purchase of a decommissioned bookmobile and turn it into something pretty amazing: a traveling library that operates on a rent-barter-donate basis and also hires itself out to local libraries and other institutions for events and programs." The BPTL "will take what its founders call the 'magic' of the bookmobile--'a rolling, roaming library that facilitates serendipitous discoveries in many different locations'--and put it to work in our own moment. That means collaborating with the food trucks that increasingly roam Houston's streets.... And it means helping librarians deal with shrinking budgets and a fragmented, twenty-first-century audience." "By bringing the library to the community instead of waiting for the community to come to the library," BPTL's founders said. After 40 years in the book business, most recently as a sales representative for University of California Press and Princeton University Press, Bob Rosenberg has decided to set up shop as an independent commission sales rep based in the San Francisco Bay area. His first client is the University of California Press. The Bob Rosenberg Group is located at 2318 32nd Avenue, San Francisco, Calif. 94116; 415-564-1248; bob@bobrosenberggroup.com; www.bobrosenberggroup.com. Illuminations: A Novel of Hildegard von Bingen by Mary Sharratt (Houghton Mifflin Harcourt). This morning on Imus in the Morning: Bill O'Reilly, co-author of Killing Kennedy: The End of Camelot (Holt, $28, 9780805096668). He will also appear tomorrow on Katie and on the Late Show with David Letterman. Tomorrow morning on Good Morning America: Rod Stewart, author of Rod: The Autobiography (Crown, $27, 9780307987303). Tomorrow morning on Fox & Friends: Jayne Amelia Larson, author of Driving the Saudis: A Chauffeur's Tale of the World's Richest Princesses (Free Press, $25, 9781451640014). Tomorrow on Sirius XM's Bob Edwards Show: Chrystia Freeland, author of Plutocrats: The Rise of the New Global Super-Rich and the Fall of Everyone Else (Penguin Press, $27.95, 9781594204098). Tomorrow on CBS's the Talk: Paul Carrick Brunson, author of It's Complicated (But It Doesn't Have to Be): A Modern Guide to Finding and Keeping Love (Gotham, $22.50, 9781592407699). Tomorrow on PBS's Nova: Sian Beilock, author of Choke: What the Secrets of the Brain Reveal About Getting It Right When You Have To (Free Press, $15, 9781416596189). Tomorrow night on the Daily Show: Dakota Meyer, co-author of Into the Fire: A Firsthand Account of the Most Extraordinary Battle in the Afghan War (Random House, $27, 9780812993400). Tomorrow night on the Colbert Report: Anthony Everitt, author of The Rise of Rome: The Making of the World's Greatest Empire (Random House, $30, 9781400066636). A 16-minute behind-the-scenes reel from Cloud Atlas "shows the terrible fate that awaits our planet," io9 reported, noting: "We're especially taken with the post-apocalyptic speech in the jungle future, where cannibal Hugh Grant is a huge problem." Cloud Atlas opens Friday. Ang Lee's Life of Pi "is turning into a major awards contender and now the studio is amping up its marketing push, hoping to crossover from critical raves to actual box office success," Indiewire reported, noting that 20th Century Fox has released both a behind-the-scenes featurette and a clip. Life of Pi opens November 21 in both 2D and 3D. Brian Conn has won the 2013 Bard Fiction Prize, intended to support promising young fiction writers. The prize has a $30,000 cash award and appointment as writer in residence at Bard College for a semester. Conn won for his debut novel, The Fixed Stars (Fiction Collective 2), published in 2010. The prize committee praised the science fiction book for "the remarkable way the weird, perplexing bleakness of the imagined society is firmly held in place by a narrative style at once bewildered and lucid--it has the air of a kind of deadpan tragedy, of the sort Kafka scared us with, and made us yearn for more. The Bard Fiction Prize has been anxious to celebrate innovation in the novel--and in Conn's The Fixed Stars we found a perfect match of inventive fable with disquietingly radical storytelling. The prose sparkles with unique images, and the narrative itself is wonderful, at times wondrous even, and a highly original formal work, full of life." The Mandlebaum Gate by Muriel Spark. The shortlist was selected by scholars and students of literature at the University, and its "eclectic nature reflects a selection process that involved passionate debates by students," the Telegraph reported. A winner will be announced in December. When people think of Thornton Wilder these days, it likely involves a vague memory of a high school performance of Our Town. The wise old Stage Manager of the play became many generations' image of the playwright himself, but few know Wilder's other plays or bother to read his seven novels (except maybe The Bridge of San Luis Rey--like Our Town, a Pulitzer winner exiled to the dread high school required reading list). Thanks to Penelope Niven (Carl Sandburg: A Biography), this void in American literary biography has been exquisitely filled. With the death of Isabel Wilder (his sister and literary executor) in 1995, "ninety banker's boxes" of Wilder's letters and journals became available through the Yale Beinecke Library, and Niven spent more than a decade studying these primary sources. Thornton Wilder: A Life is biography as biography should be, and as the conservative classicist Wilder would no doubt have wanted. Niven quotes extensively from the Yale papers, the letters of Wilder's many friends, and conversations with his family and colleagues. Except as supported by primary sources, she makes no attempt at psychological speculation and refreshingly avoids any literary criticism of his work except as found in his own letters or as published by critics and friends. Rather, in straightforward, mostly chronological chapters, Niven taps Wilder's own words to tell much of his remarkable story and that of his equally literary family. They lived peripatetic childhoods in Wisconsin, California, Connecticut, China and Europe as his father struggled to raise them all according to his strong convictions and earn enough to educate them without fear of financial ruin, while serving his country as a diplomat. Wilder's was a writing family all their lives--by necessity almost, since letters, books and journals became the glue holding the scattered family together. From this diverse background, the shy letter writing young man emerged to become a lifelong world traveler, reader, solitary walker, cross-country driver, scholar, teacher, playwright, actor, novelist, soldier, financially successful family benefactor and friend to seemingly everyone he met from Ernest Hemingway and Gertrude Stein to boxer Gene Tunney, actress Ruth Gordon and (perhaps his closest friends) critic Alexander Woollcott and University of Chicago President Robert Hutchins. 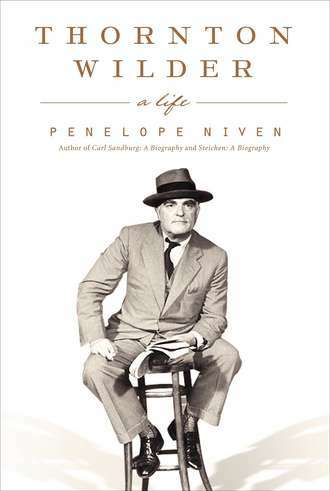 Shelf Talker: With access to Wilder's voluminous letters and journals, Niven captures the remarkable life of this 20th-century American man of letters.